Tutorial Learn how to use Betmix. 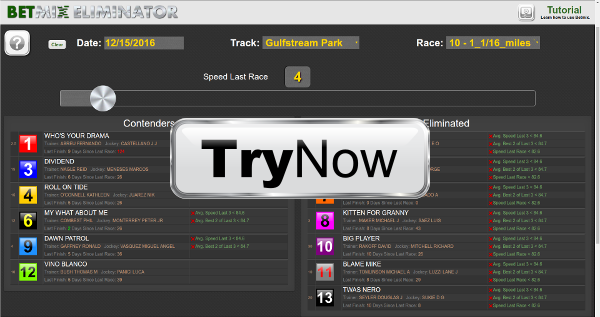 Join Now All Races - All Tracks - All Tools - Start Winning! BetMix Labs is a place to play with some of the new handicapping projects we have been working on. You can find a description of each of the tools below. Think of this as a playground where you can experiment with different ways to analyze a horse race. We hope that these tools will generate feedback and ultimately lead to better handicapping methods. Let us know what you think of these tools, what you like and dislike about them, and above all we hope that they encourage you to think of new ways to handicap. Send those ideas to us and maybe they will eventually be part of BetMix Labs. Have fun! The Idea: Eliminator is based on “Three strikes and you’re out.” We look at the race type you are handicapping and start with the most important factor. If a horse falls out of the range where 95% of the previous winners of that race type were, it earns a strike. For example, if you are looking at a 6f Dirt Claiming race and the best factor is Speed Last Race, we may know that 95% of previous winners were within 30% points of the horse with the best Speed Last Race number. So all horses with scores of 100 – 70 would be safe. Horses with scores of 69 and less would earn a strike. As you move the slider from left to right more factors will be tested and more strikes will be earned. When a horse earns three strikes they are moved from Contenders to Eliminated. Eventually you will end up with only the most likely winners in the Contenders column. Strengths: Good at analyzing more common race types, medium field sizes, and races where horses have a deeper racing history. Weaknesses: In some cases, the winner will be tossed early. Using the example above, a horse may earn a strike for Speed Last Race because it had a bad trip, or maybe it was running in a race very different from today’s race type and earned a poor figure because it didn’t like the surface or distance. Always take a second look at horses that have been eliminated to see if they have legitimate excuses for being struck out! The Idea: What happens if you pick 3 factors and look up each horse in the race in ANGLER based on those rankings? Can you use that data to find what chance each horse has of winning this race, and what the typical ROI is for horses like that? Tackle Box looks at similar races (same distance, surface, class and number of starters) and finds out how well horses have run who are ranked similarly to horses running in today’s race. For example, how well have horses run that are ranked 1st in Speed Last Race, 3rd in Last E2 Pace, and 5th in Jockey Current Meet? You pick the factors you want to use, and Tackle Box will go get the data. 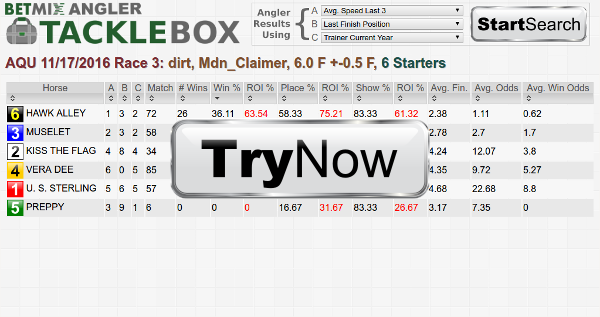 Strengths: Tackle Box works best in races with less than 8 horses, and when you select meaningful factors to use in the analysis. The best approach is to look at the Race Profile Stats for the race you are handicapping and pick 3 top ranked factors from different groups. You probably don’t want to use 3 speed factors. A good example would be to use a speed factor, a pace factor and a form factor. Weaknesses: When you analyze races with large fields using Tackle Box you may not get complete data. You want to use races where you can find a large sample of previous runners who are ranked similarly, and if you have a big field in an uncommon race type you may find that there has never before been a horse that is ranked the same way as one of the horses into today’s race. The Idea: Certain horses win when they are in their comfort zone. It may be how highly they are ranked in terms of pace, speed, etc. When they are in that zone they are likely winners. If they are in a race where they are way out of their comfort zone they may be in for a tough race.Range Finder will look at each horse in a race, and using Angler data, determine how each horse was ranked in its previous winning efforts. 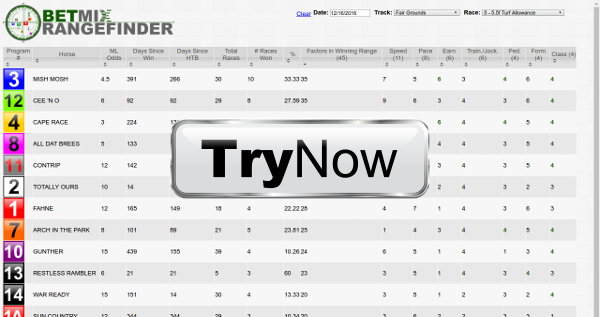 It will tell you the number of factors that the horse is ranked above or equal to when compared to its previous wins. Strengths: Range Finder is best at analyzing races for older, more experienced horses, where each horse has more than 2 lifetime wins. Weaknesses: Range finder will not work at all on maiden races (they have no wins to analyze). It will work on races where the horses only have 1 lifetime win, but not very well. Pay attention to days since last win in the display. This tools uses data from winning races, and if a horse hasn’t won a race in 200 days or more the data is not fresh and the results are unreliable.